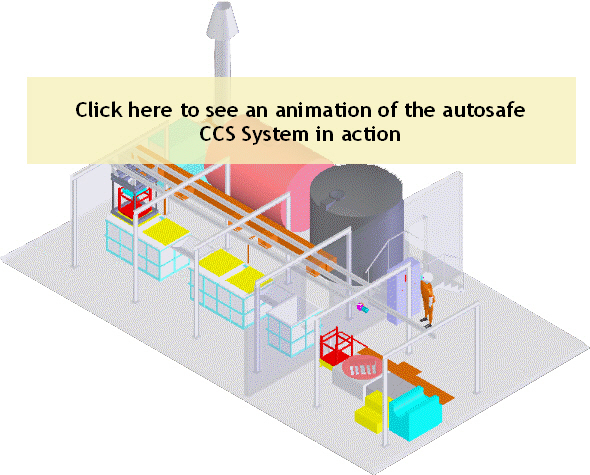 Designed to process dies automatically, the JIPL Auto-Safe CCS (Caustic Die Cleaning System) is an innovative technology that processes dies automatically in an environment physically isolated from the operator for greater safety and control. 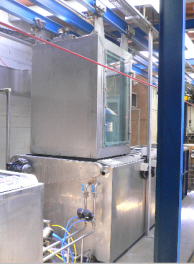 The JIPL ‘Auto-Safe CCS 2000’ plant has a dividing wall between the ‘Working’ and ‘Processing’ areas, so all processing operations are carried out automatically inside the isolated enclosure. Plants are designed to cater for processing tanks of different sizes (Auto-Safe CCS 2000 – 2,000-litre tanks) and can be semi-automated where full automation is not desired. Processing times & number of crates processed monitored real time. Fumes removed via ventilation system to protect workers and scrubbed prior to release to the environment. Step 1 – In the working area, the operator loads the dies into crates and moves the crates from the Loading Table to the Transfer Table. Step 2 – The operator selects the automatic hoist to pick up the crate for processing – and the automatic die cleaning operation takes over. Step 3 – On process completion, the operator chooses ‘Unload’ and the crate is moved to the Transfer Table where the operator inspects the dies and moves the crate to the Die Processing table for unloading. Automatically and safely removes residual aluminium from metal dies after removal from the extrusion press. The system can be modified to any application where high strength caustic is used for processing.